In a pattern that has frustratingly continued throughout the month of January, a third-period Terrier rally came up short and was ended by an empty-net goal. This time it was #10 Lowell that kept BU out of the win column, taking a 3-1 victory at Tsongas Arena. The previous time the teams met was in last season's Hockey East championship game with the River Hawks edging BU, 1-0, in former Head Coach Jack Parker's final game behind the Terrier bench. Last night, Sean Maguire turned away a season-high 39 shots, yielding two goals for the Terriers who again dressed only 17 skaters and then lost blueliner Ahti Oksanen to a second-period injury. Lowell got goals in the first period from Scott Wilson and second period from Terrence Wallin for a 2-0 lead. The power play resulting from Oksanen’s injury on a knee-to-knee hit carried into the third period and BU capitalized when freshman Kevin Duane (photo) blasted a shot past Connor Hellebuyck from the top of the circle for his fourth of the season. A Cason Hohmann attempt rang off the crossbar. With Maguire pulled, Joe Pendenza’s empty-netter finished off BU’s attempts to knot the score. ► BU announced that former Head Coach Jack Parker’s number from his playing days, #6, will be retired during a ceremony on February 15 when New Hampshire visits Agganis Arena. 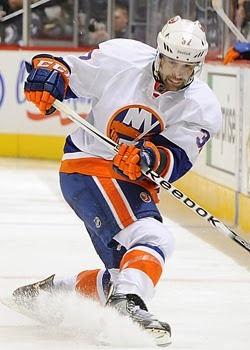 Brian Strait recorded his third goal and then his fifth assist in the Islanders’ 6-4 loss to Philly. All three goals were scored in the past month. Matt Nieto scored the game’s first goal and later added an assist in the Sharks5-4 win against Tampa Bay. Alex Chiasson’s ninth goal of the season brought Dallas even with Minnesota in the third period, but the Wild won in overtime, 3-2, with Charlie Coyle assisting on the game-winner. Nick Bonino assisted on two goals, including the game-winner, in the Ducks’ 3-2 win against the Blues. Has a 5-7-12 line in his last 10 games. 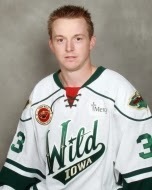 Former All-American and Hockey East player of the year John Curry turned away all 45 shots he faced to backstop a 1-0 shutout for the Iowa Wild over Lake Erie. Curry, who earlier this week was named to the next inductee class for the BU Athletics Hall of Fame, earned first-star honors and gained his third win since being called up to Iowa. Former Terrier blueliner David Warsofsky scored his third goal of the season for Providence in the P-Bruins’ 5-3 loss to Springfield. CHCH-TV News profiles former Terrier Justin Courtnall, now with the Hamilton Bulldogs. Terriers look to rebound from Friday’s 4-3 loss to Providence and take on crosstown rival Northeaster today at Walter Brown Arena. Game time is Noon. In the teams’ most recent matchup last month, a 5-2 BU win, sophomore Sarah Lefort produced a hat trick and captain Louise Warren registered four points. Earlier in the season the Terriers edged the Huskies, 3-2 in overtime.